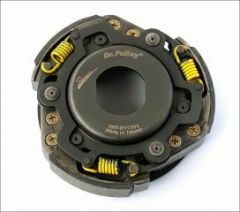 Just installed these yesterday and, in combination with the Dr Pulley rolls, the scooter (Honda 300 SHi) performs much better in comparison to the original Honda rolls and sliders (that I just installed a few months ago, so they were also quite new). I put these sliding pieces into the variator of a Honda SH300 at about 2,000 miles, along with 17g weights (original weights being 19g). After inspection at 10,800 miles (checking for belt wear), I noticed that these sliding pieces had all cracked, and one had a chunk completely missing. I replaced them with the original Honda pieces. 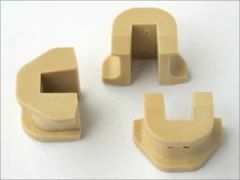 So the main thing to be aware of is that these pieces don't last very long. I'd advise inspecting the pieces at least every 6000 miles, possibly even preemptively replacing them rather than waiting for damage. 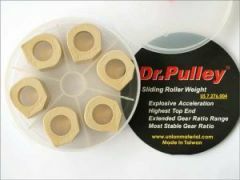 Dr.Pulley sliding roll size 30x19mm, weight 23 grams 8 pieces / package. 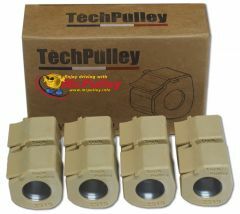 TechPulley sliding rolls in the 25x17mm format, weight 18 grams 8 pieces / package.